The de Vere White family welcomes you to our pubs, where we hope you'll find your home away from home. We come from a long line of Irish innovators, publicans, brewers, and writers. We strive to keep the family tradition alive through our authentic establishments. 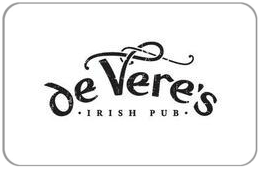 Gift Cards can be redeemed at any de Vere's Irish Pub location! For balance inquiries call the phone number to a De Vere's Irish Pub's location below.